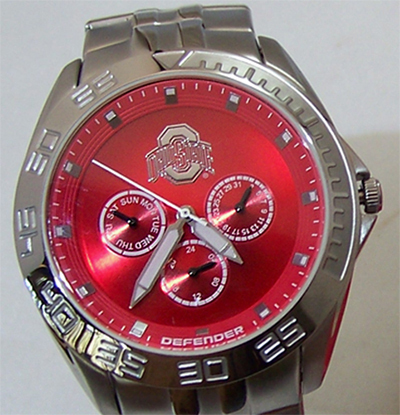 Click the button below to add the Ohio State Buckeyes Fossil Watch Mens Multifunction Defender Li2781 to your wish list. 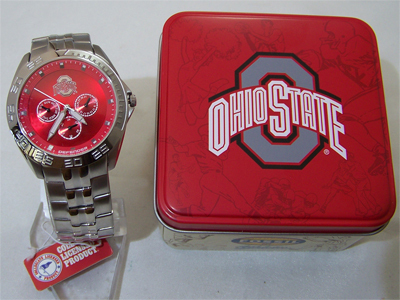 Ohio State University Buckeyes Fossil Watch, Mens New. Fossil Defender LI2781 Mens Multifunction Wristwatch. NCAA college sports fans team logo wristwatches, watches. 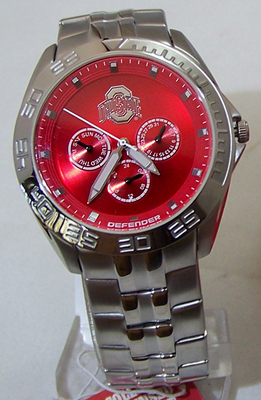 This great mens Fossil Ohio State multifunction sports watch features the team logo on team colors with white multifunction eyes for day, date, and 24 hour display. Stainless steel case and comfortable contoured band. Three-hand quartz movement. Comes with an 11-year warranty and packaged in a collectible Fossil tin. 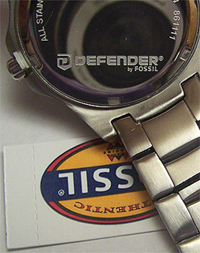 Water resistant up to 100 meters 335 ft. Comes on Fossil Rare Defender logo. Fossil's Smart Links, more easily adjust bracelet size.